Abstract. 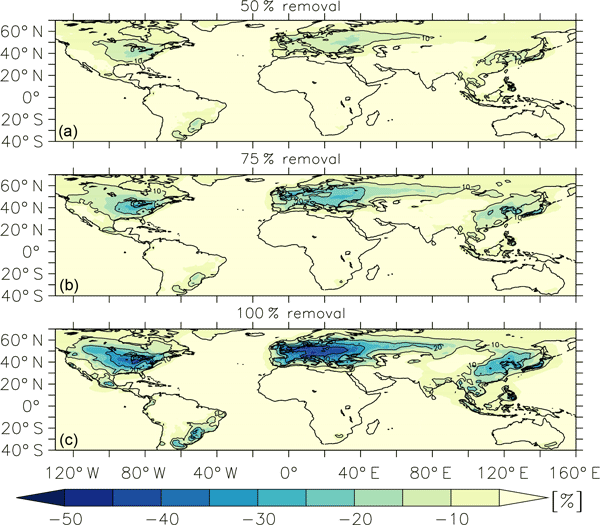 A global chemistry-climate model has been used to study the impacts of pollutants released by agriculture on fine-particulate matter (PM2.5), with a focus on Europe, North America, East and South Asia. Simulations reveal that a relatively strong reduction in PM2.5 levels can be achieved by decreasing agricultural emissions, notably of ammonia (NH3) released from fertilizer use and animal husbandry. The absolute impact on PM2.5 reduction is strongest in East Asia, even for small emission decreases. Conversely, over Europe and North America, aerosol formation is not immediately limited by the availability of ammonia. Nevertheless, reduction of NH3 can also substantially decrease PM2.5 concentrations over the latter regions, especially when emissions are abated systematically. Our results document how reduction of agricultural emissions decreases aerosol pH due to the depletion of aerosol ammonium, which affects particle liquid phase and heterogeneous chemistry. Further, it is shown that a 50% reduction of agricultural emissions could prevent the mortality attributable to air pollution by ∼ 250 000 peopleyr−1 worldwide, amounting to reductions of 30, 19, 8 and 3% over North America, Europe, East and South Asia, respectively. A theoretical 100% reduction could even reduce the number of deaths globally by about 800000 per year. How to cite: Pozzer, A., Tsimpidi, A. P., Karydis, V. A., de Meij, A., and Lelieveld, J.: Impact of agricultural emission reductions on fine-particulate matter and public health, Atmos. Chem. Phys., 17, 12813-12826, https://doi.org/10.5194/acp-17-12813-2017, 2017.